Our lists of the 50 greatest Mozart, Beethoven and Bach recordings have proved phenomenally successful, and so we are proud to present 50 of the finest recordings of Chopin's music. Included here are Gramophone Award-winning albums, Recordings of the Month and Editor's Choice discs from Rubinstein, Argerich, Pollini, Perahia, Cortot, Grosvenor, and many more. We have included, where possible, the complete original Gramophone reviews, which are drawn from Gramophone's Reviews Database of more than 45,000 reviews. To find out more about subscribing to the Database, visit: gramophone.co.uk/subscribe. All of these lists are, of course, subjective, but every recording here has recieved the approval of Gramophone's critics and are artistic and musical benchmarks. 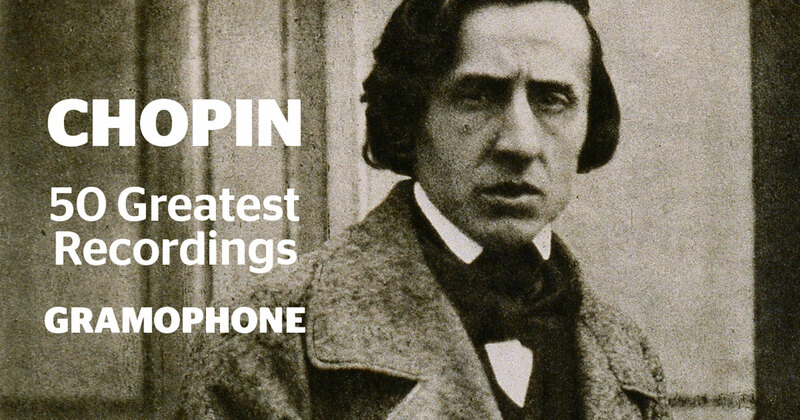 If you want to hear Chopin performance at its best, this list is the perfect place to start. Martha Argerich’s first commercially released recordings of the Chopin concertos were for DG; No 1 in 1968, No 2 in 1978. Here she revisits both concertos and offers an act of re-creative daring, of an alternating reverie and passion that flashes fire with a thousand different lights. Indeed, her earlier performances are infinitely less witty, personal and eruptive, less inclined to explore, albeit with the most spontaneous caprice and insouciance, so many new facets, angles and possibilities. Now, everything is accomplished without a care for studios and microphones, and with a degree of involvement that suggests an increase rather than a diminution of her love for these works. The recordings are impressively natural and if Dutoit occasionally seems awed if not cowed into anonymity by his soloist (the opening tuttis to the slow movements of both concertos are less memorable than they should be) he sets off Argerich’s charisma to an exceptional degree. Argerich’s light burns brighter than ever. Rarely in their entire history have the Chopin concertos received performances of a more teasing allure, brilliance and idiosyncrasy. A welcome change from the standard coupling of the two concertos, this programme is a distinguished addition to the bicentennial celebrations, an all-Polish affair with the exception of its Uzbek soloist. It is salutary to be reminded that the Fantasia and Krakowiak were composed when Chopin was still a teenager (1828). The Concerto No 2 was written a year later with Concerto No 1, confusingly, following a year after that. Chopin’s orchestration, so frequently criticised and occasionally revamped by others, serves its purpose more than adequately and is handled here with workmanlike authority by Wit and his players, placed in an acoustic which borders on the roomy. But the piano’s the thing and Nebolsin proves himself a scintillating and persuasive Chopinist, alive to every detail and, indeed, subtly highlighting a few that are generally ignored. No 1’s Rondo is the highlight of the disc, nonchalantly fleet-fingered, beautifully phrased and conveying a real joy of shared music-making. The Fantasia and Krakowiak are no less successful. Having enjoyed Nebolsin and his colleagues so much in the First Concerto it’s good to report that the second volume lives up to its predecessor in every way, and the slight reservations about the acoustic and workmanlike accompaniment seem marginal considerations here. In fact, an arbitrary comparison with the Argerich/Dutoit EMI recording (see above) reveals far cleaner textual details and a more integrated keyboard and orchestral relationship. Tempi are judged to a nicety and, once again, in the finale of the concerto, Nebolsin’s insouciant playfulness is a real delight. The rarely recorded Là ci darem Variations are welded into a cohesive whole in what is a new benchmark recording (try the final pages of the Alla polacca variation, with Nebolsin’s left hand injecting a motoric rhythm against the non-stop right-hand semiquavers). This, Chopin’s earliest work for piano and orchestra (1827), is followed by his last (completed in 1835) to round off in exuberant high spirits a highly recommended disc. Perahia has never made any secret of his liking for the ‘inspirational heat-of-the-moment’ of a live performance as opposed to a studio recording, where ‘sometimes things get tame’. As enthusiastic audience applause (discreetly rationed on the disc) makes plain, these two concertos were recorded live at Tel Aviv’s Mann Auditorium. Whether they were subsequently ‘doctored’ we don’t know, but the finished product brings us a Perahia miraculously combining exceptional finesse with an equally exceptional urgency. In all but the finale of No 1 (where Pollini on EMI beats him by a minute) his timings throughout both works are considerably faster than most of his rivals on disc. Was this prompted by ‘inspirational heat-of-the-moment’? Or was it a deliberate attempt to come closer than others do to the surprisingly briskish metronome markings printed in the Eulenburg scores? The two slow movements are distinguished by exquisitely limpid cantabile and superfine delicacy of decorative detail while again conveying urgent undercurrents. But in a guessing game perhaps it would be the two finales that would most betray the identity of the soloist. Not only are they faster, but they are also of a more scintillating, scherzando-like lightness. The recording is first rate. Mercifully uncut, unlike Rubinstein’s previous discs of both concertos with Barbirolli, these are astonishing performances, occasionally, particularly in the Second Concerto, content simply to astonish. Here there is an almost arrogant dismissal of all difficulties and a prima donna stance sometimes hard to square with some of Chopin’s more delicate and ornate confidences. In the scintillating coda Rubinstein takes his bravura to a spine-tingling edge, but in, for example, the Larghetto’s central storms there is a brusque, streamlined indifference to the music’s finer qualities. In the First Concerto, while recognisably the same pianist, Rubinstein is altogether more subtle, following his characteristic exuberance and extroversion with playing of a rapt magic and delicacy. The music may be sent smartly on its way by both conductor and soloist, but the patrician ease, nonchalant glitter and authority of Rubinstein’s playing are uniquely his to command. These are both extraordinary performances by an extraordinary pianist, though of the two, the First Concerto is the more affecting. Mark Obert-Thorn’s restoration of the 1953 sound is a model of remastery though even he cannot make the 1946 Second Concerto sound less than cramped. This disc is a classic. The concerto was recorded shortly after the 18-year-old pianist’s victory at the Warsaw competition in 1959. Nowadays we might expect a wider dynamic range to allow greater power in the first movement’s tuttis but in all other respects the recording completely belies its age, with a near-perfect balance between soloist and orchestra. This is very much Pollini’s disc, just as the First Concerto is very much the soloist’s show, but effacing as the accompaniment is, Pollini’s keyboard miracles of poetry and refinement could not have been achieved without one of the most characterful and responsive accounts of that accompaniment ever committed to tape. The expressive range of the Philharmonia on top form under Kletzki is exceptional, as is the accord between soloist and conductor in phrasing and shading. The solo items are a further reminder of Pollini’s effortless bravura and aristocratic poise. Here in all his glory is Friedrich Gulda the ultimate maverick pianist, yet beneath his determined assault on what he saw as the stuffy conventions of the music world (the Viennese world in particular) lay a pianist of genius aptly described by Martha Argerich, his one-time protégée, as ‘the most extraordinary and brilliant man I ever met’. Certainly all the live performances on these discs create a towering tribute to Chopin. Forever the nonconformist, Gulda may sometimes be wilful and irascible but he is never less than mesmeric and fascinating. Time and again he casts a novel and intense light on even the most familiar phrase, making you hang on every note. Try Prelude No 14 for a virtuoso savagery beyond the world of other more ‘civilised’ pianists, or No 13 where Gulda’s rapture makes the music stretch seemingly to infinity. Again there may be moments in the Ballades and Barcarolle where the playing verges on hysteria but the sheer mastery and strength are like an elemental force of nature. Even when he takes a rough hand to some of Chopin’s more intimate confessions, his way with his selection of Nocturnes creates a sense of drama and occasion light years away from more recent recordings. The First Concerto is given in Balakirev’s touched-up version and if in the studio Gulda’s playing is more disciplined, less free-thinking, it is also of a special imaginative delicacy and engagement. The programme ends with Gulda’s own Epitaph for a Love, a strange mixed-up jazz effusion that includes some very odd vocals in Viennese dialect and a phantom reference to Chopin’s C minor Prelude. The pianist’s son, Paul Gulda, writes a moving and informative essay clarifying much of his father’s complexity and telling us, perhaps not surprisingly, that Alfred Cortot was among his chief musical idols. The performance of the Chopin Sonata is unusually successful. One is often conscious in this work of a mismatch between the characteristic elaboration of the piano part and the writing for cello, generally more plain and unadorned, but Raphael Wallfisch’s eloquence disposes of any problem; the two instruments, each with its distinctive role, balance one another perfectly. There’s an air of spontaneity, yet the expressive weight of each phrase is carefully considered, by York as well as by Wallfisch, giving the whole work a powerful sense of unity. York and Wallfisch adopt a no-holds-barred approach to the ultra-romantic Szymanowski, a successful transcription of his early Violin Sonata. Their grand gestures carry complete conviction and sweep us along, even over the finale’s obsessive repetitions. Simon Laks had already settled in Paris when he wrote his 1932 Cello Sonata. There are echoes of Les Six, Stravinsky and Ravel, whose G major Violin Sonata surely provided the model for the languid, bluesy middle movement. It’s a deftly composed, attractively varied work and, as with the other items, the performance is exemplary. The recording by Paul Tortelier and Aldo Ciccolini of the last work Chopin published (Paris, 1847), which they couple with Rachmaninov's Sonata, has been a favourite of mine since it appeared. But I am at last almost persuaded that it has been supplanted. In fact, both that performance and this one by Mstislav Rostropovich and Martha Argerich are of strongly marked character, acutely, though differently, responsive to the music's every inflection, and both provide deep satisfactions. The Tortelier recording is somewhat warmer, the separation between the instruments better defined; yet this recording is excellent also. A lesser known Chopin work for cello and piano is the Introduction and Polonaise brillante, Op 3 (though it is not so little known as his Grand Duo on themes from Meyerbeer's Robert Ie Diable). He wrote the Polonaise in October 1829, adding a touching Introduction the following July. This new performance is easily the best I have ever heard and one particularly enjoys the counterpoint of slow cello and fast piano, of ardent lyricism and exuberant virtuosity. This is altogether a recording of magnificent playing. Here, simply and assuredly, is one of the most magisterial talents in the entire history of piano playing. She’s hardly a comfortable companion, confirming your preconceptions. Indeed, she sets your heart and mind reeling so that you positively cry out for respite from her dazzling and super-sensitive enquiry. But she’s surely a great musician first and a great pianist second. From her, Chopin is hardly the most balanced or classically biased of the Romantics. She can tear all complacency aside. How she keeps you on the qui vive in the Second and Third Sonatas. Is the Funeral March too brisk, an expression of sadness for the death of a distant relative rather than grief for a nation? Is the delicate rhythmic play at the heart of the Third Sonata’s Scherzo virtually spun out of existence? Such qualms or queries tend to be whirled into extinction by more significant felicities. Who but Argerich, with her subtle half-pedalling, could conjure so baleful and macabre a picture of ‘winds whistling over graveyards’ in the Second Sonata’s finale, or achieve such heart-stopping exultance in the final pages of the Third Sonata (this performance is early Argerich with a vengeance, alive with a nervous brio). And if her free spirit leaves us tantalised, thirsting for Chopin’s First, Second and Fourth Scherzos as well as his Third, for example, she has also left us overwhelmingly enriched, forever in her debt. The programme embraces Chopin’s Opp 33‑38 with the exception of the two Nocturnes, Op 37, though they’re not played in chronological order. Pollini begins with a magnificent account of the Ballade No 2, the maelstrom that erupts after the pastoral first page sounding like a howl of despair. The four Mazurkas, Op 33, and three Waltzes, Op 34, not only form a contrast to the Ballade but are themselves contrasted with each other. The F sharp major Impromptu, almost a mini-ballade, is heard in another refined account, Pollini relishing the leggiero jeu perlé scale passagework at the close. In the Second Sonata, Pollini unites what Schumann called ‘four of [Chopin’s] wildest children’ into a family, a feat managed by few pianists, the first movement (with a da capo repeat) leading quite naturally into the Scherzo and so on. It’d be difficult for Pollini to produce an ugly sound (and he doesn’t here), but while the piano is captured from a slight distance (say the front row of the stalls), the pianist’s frequent nasal intakes of breath are recorded in close-up.